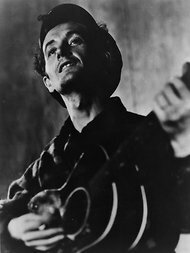 ¶ 3 Leave a comment on paragraph 3 0 Song to Woody is Dylan’s homage to his greatest early influence, Woody Guthrie. The second original on this album., it’s a simple and honest reflection on the person that inspired him to become a folk singer. ¶ 4 Leave a comment on paragraph 4 0 Dylan speaks of seeing the world through Guthrie’s eyes. ¶ 6 Leave a comment on paragraph 6 0 He mentions three of America’s greatest depression-era folk singers: Guthrie, Leadbelly and Cisco Houston. 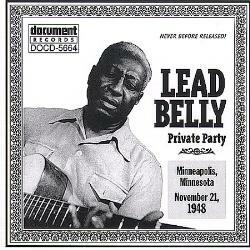 ¶ 7 Leave a comment on paragraph 7 0 Leadbelly was a close friend and sometime collaborator of Guthrie’s. He wrote a number of great songs that are still well-known today, such as Goodnight Irene, Rock Island Line, and The Midnight Special. He was also a fine interpreter of traditional works. Cisco Houston was Guthrie’s traveling companion for many years. Dylan discussed the influence these men had during a 1984 interview done with Bert Kleinman. ¶ 8 Leave a comment on paragraph 8 0 Because they were original, they just had a mark of originality on them, well the lyrics did. I just heard all those songs and I learned them all off the records. All the songs of Woody Guthrie that I could find, anybody that had a Woody Guthrie record or that knew a Woody Guthrie song. And in St. Paul at the time, where I was, there were some people around who would not only had his records but who knew his songs. So I just learned them all, some of the best records that I heard him make were these records that he made on the Stinson label, with Cisco Houston and Sonny Terry. I don’t know if Leadbelly was on there too, I learned a bunch of Leadbelly’s stuff too and learned how to play like that. But one of the biggest thrills I ever actually had was when I reached New York, whenever it was, and I got to play with Cisco Houston, I think I got to play with him at a party someplace. But I used to watch him, he used to play at Folk City. He was an amazing looking guy, he looked like Clark Gable, like a movie star. ¶ 9 Leave a comment on paragraph 9 0 Dylan borrowed the tune used for this song from Guthrie’s 1913 Massacre. ¶ 13 Leave a comment on paragraph 13 0 Song to Woody has not been released on an official live album. Dylan did perform the song at the Bob Dylan 30th Anniversary TV special, but it was not included on the released soundtrack (don’t bother seeking it out – not great). A live performance from 2000 was included on the European version of the single for Things Have Changed. ¶ 16 Leave a comment on paragraph 16 0 Dave Von Ronk version. ¶ 19 Leave a comment on paragraph 19 0 Uncle Tupelo (Wilco’s Jeff Tweedy early group).